FALLUJAH, Iraq -- Lance Cpl. 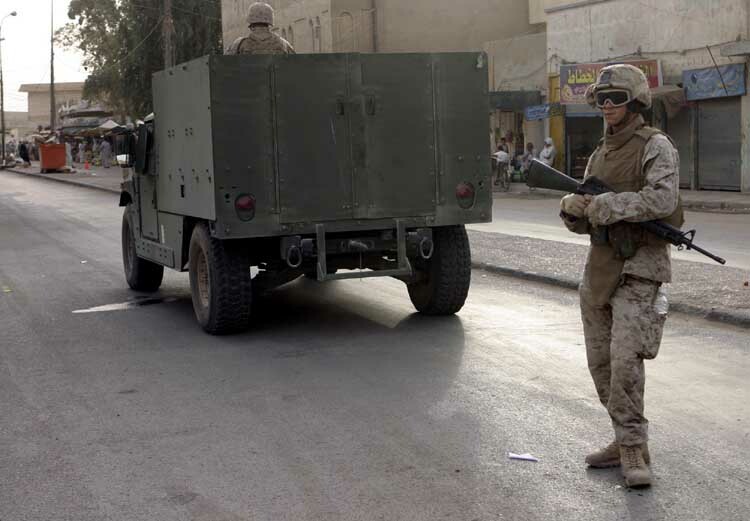 Daniel Ramos, an infantryman with Surveillance, Target and Acquisition platoon, Company W, 1st Battalion, 6th Marine Regiment, provides security behind a new MAK HMMWV (Marine Armor Kit equipped High Mobility Multi-Wheeled Vehicle) in downtown Fallujah. The 19-year-old Orange Park, Fla. native’s unit is currently receiving several of these hardened vehicles to protect the troops against roadside bomb detonation and small arms fire.